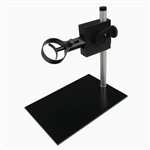 This stand is designed to work with the popular USB Digital microscopes. Use this in place of those mircscope's included stands for improved positioning and accuracy. It features 360 degree rotation on all axes and is easy to assemble. Made of plastic, is lightweight and easy to carry. Digital MIcroscope is not included.